My Life, Loves and Passion: Book Spotlight for The Demons of Plainville! Join me as I talk about the loves of my life. My Family, Books, and food! Book Spotlight for The Demons of Plainville! Some true stories read like fiction, but for those who have to personally live through the experiences, the nightmare is vividly real. 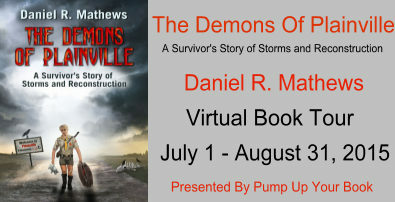 Daniel R. Mathews digs into the darkness of his past with his haunting memoir, The Demons of Plainville. As a child, Daniel struggles to find his footing in an upside-down world. His mother is mentally ill and addicted to drugs; she performs black masses to summon demons, is physically abusive, and plays brutal mind games that make him doubt his sanity and despair of ever making sense of life or himself. Even his father beats Daniel after “rescuing” him from his mother. Thanks to a few unexpected friends, Daniel survives his devastating youth and emerges stronger for it. But Daniel’s battles aren’t over. Finally free of his abusive parents, he now must face himself and wrestle with his sexual identity in a community that sees nothing wrong with homophobia. Candid and compelling, this is a triumphant tale of a young man who walked through the darkness, bravely faced his demons, and against all odds carried the faint light of hope with him every step of the way. Accusations. This is how it always begins. S Screaming follows when my answers prove inadequate. Then come the threats, and finally the misery of surrender. would be awaiting me, starting the cycle anew. “I don’t know,” I say defensively, shrugging my shoulders. times of sadness or anger. family misfortune. I just did not understand. me, one that persisted throughout my childhood. she found at me. I clung to my stuffed bear, looking up at her. to hug it with all my strength. overtook me. At first, heat surged through my body, then excitement. it did not grow for a while. airport just to the north. the lawn or helped him weed his small garden. my mother was staying in at the end of the house. calm, I would be protected. mother held the chalice upwards as an offering and mumbled a few words. the bells, driving away the demons. I couldn’t see these creatures, but the air was laden with smoke and darkness. I was sure the demons were there. felt emotionally close and accepted by my mother, so I was grateful for them. taking various prescriptions that generally left her tired and moody. Loving the outdoors and the woods, I approved of our new home’s location. dream didn’t last long though. assumed I was a girl, as did the kids on the bus. “Who are you?” the bus driver inquired, searching his list. I began to isolate myself. on a more menacing tone. 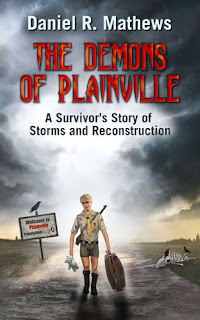 An avid reader of science fiction, horror, and fantasy, Daniel R. Mathews is a novelist and nonfiction writer whose books feature LGBT youth braving danger with honor and dignity, including his personal memoir, The Demons of Plainville, and debut horror novel, The Unseen Kingdom. For the past two decades, Mathews has worked as a Federal Aviation Administration (FAA) certified ground instructor, meteorologist, and a member of the web development and Internet technical support community. He currently lives in Flagstaff, Arizona. Guilt Free Motherhood book Tour! Spotlight for Of Demons & Stones! Through Lies and Heartache book tour! Blog tour for Katherine in Gold! Forged in Flame book tour with my review! Not You It's Me Promo! Bridesmaids Blues Book tour. Plus a guest post! Icarus Falling book Review and a Guest Post. Here is Harmony's Healing Cover! Book Blitz for Undying Hunger! Arlene has read 54 books toward her goal of 150 books.